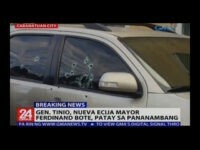 Mayor Ferdinand Bote of General Tinio in Nueva Ecija, Philippines, was pronounced dead Tuesday shortly after a gunman approached his car on a motorcycle and shot him dead in the town, the second assassination of a mayor in the country in as many days. An unidentified sniper assassinated Mayor Antonio Halili of Tanauan City in Batangas, Philippines, on Monday morning during a flag-raising ceremony as the national anthem played. Mayoral staff caught the killing on video.